Kicking off New Years Day 2015 in a positive way, artist Bob Ziller headed out for a stretch of abandoned properties in Wilkinsburg and left his mark. 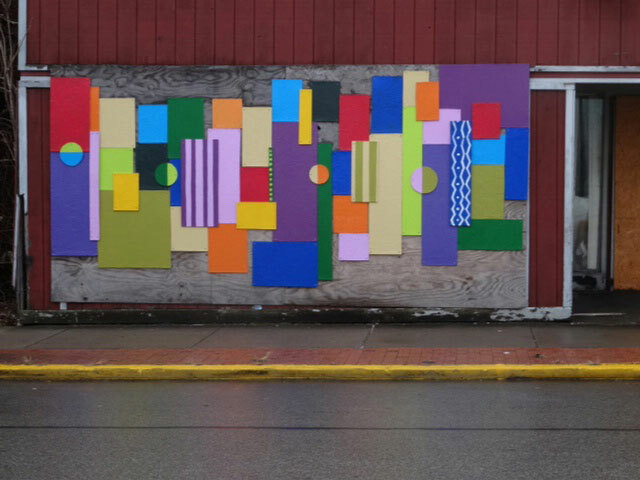 He started with two murals, but eventually he plans to extend the project to cover the entire block along Penn Ave. The boarded up, empty storefronts have left this area forlorn. Fresh, colorful artwork will now be replacing the blank eyes of those old businesses. Mr Ziller was inspired by the Romare Bearden mural titled The Block . (There’s actually a copy of that mural in Larimer.) 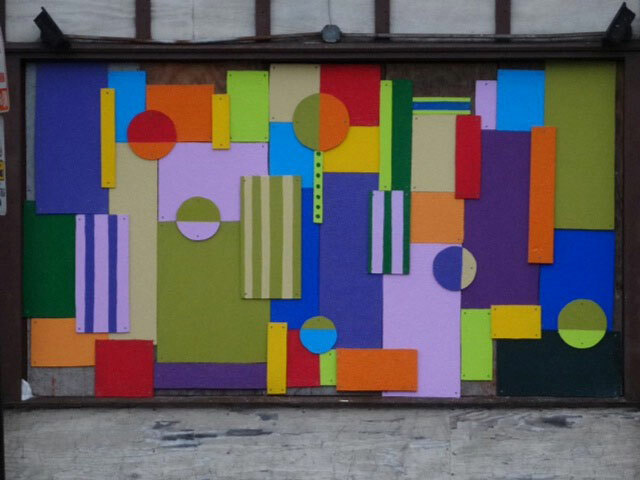 He adopted the idea of a collage and used different sizes, shapes and colors of boards to create his composition. With no finished design in mind before he begins, he selects the pieces on the spot and screws them onto the drab plywood boards that currently cover the building’s windows. Little by little he uses the vibrant colors and interesting shapes to create a new urban landscape. One look at the transformed storefronts and you get a sense of hope that’s been missing here. Art really does make a difference, and in some cases it marks the start of a transformation. We hope this new artwork is the spark that ignites that process.